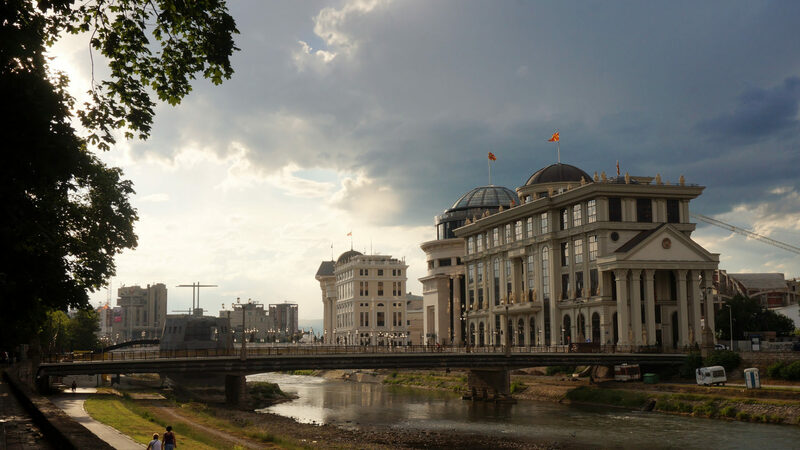 Most people agree that the plan is in bad taste and a complete farce, but what impact is Skopje's postmodern transformation having on its citizens? Under the auspices of “Skopje 2014”, a curious proliferation of statues, monuments and neo-classical and baroque architecture have lately begun popping up across Macedonia’s capital. While the expressed aim of this multi-million Euro project was to attract international investment and tourism to Skopje its international reception gives a measure of the overall cost of this project to the city’s reputation. The Guardian, for instance, ran with How Skopje became Europe’s new capital of kitsch, while CNN asked Is Macedonia’s capital being turned into a theme park? Indeed, looking at the coverage it appears to have been difficult to avoid well-worn comparisons to Disneyland or Las Vegas. The government’s ambition has been to create a new national identity by rewriting history. 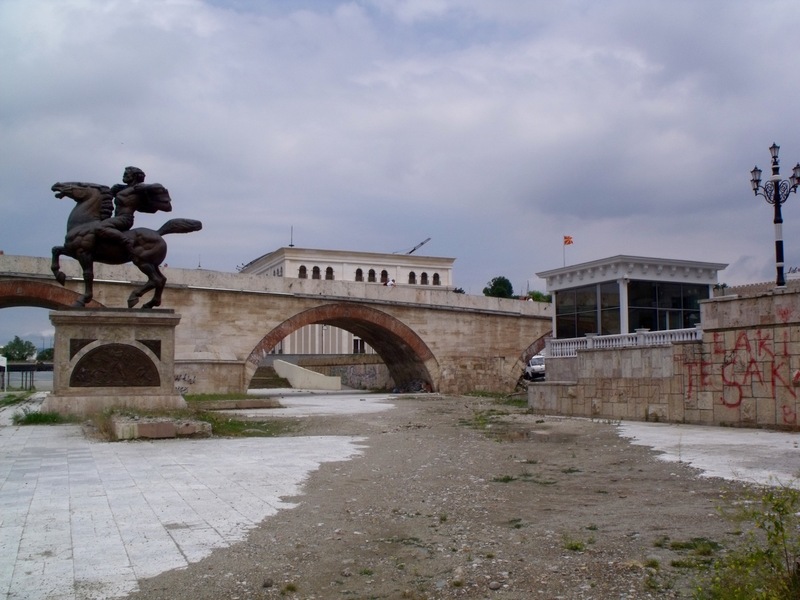 Like so many other post-socialist cities, Skopje’s recent transformation looks to a distant past, deploying collective amnesia to skip over more recent troubles. The somewhat laughable statue of Alexander the Great, a shameless attempt to claim ownership over the legacy of ancient Macedonia, is perhaps the most obvious example. This postmodern fantasy may be amusing to the rest of Europe, but it is hard to see what relation Skopje 2014 has to the often harsh realities of everyday life in Skopje. I spent June 2015 in Skopje to try to gain a deeper understanding of Skopje 2014, going beyond the grounds of taste to see the real impact the project has had on the city and its local people. My first impression when I arrived was that it was much more chaotic than I had anticipated.. Skopje 2014 is not a master plan or a unified whole, but rather a series of monuments, buildings and facades. Despite the deadline suggested in the name, construction work continues at many of the major sites. For almost the entirety of my visit the central square Plostad Makadonija was in the process of being re-paved (“again” I heard the locals cry). Some plans, such as the controversial facelift and privatisation of the GTC shopping centre, were added to the project later and had not even begun. In short, it seems there is still much to be done. But another thing that quickly became apparent was the extent to which Skopje 2014 is tied to a more far-reaching nationwide political crisis. Culminating in protests in May 2015, the crisis is the worst to hit the country since it gained independence from Yugoslavia in 1991, and it is amazing how quickly a conversation about neoclassical columns could turn into a conversation about protests, corruption and money laundering. This is linked to the fact that the transformation is almost entirely funded by the government, who managed to completely bypass local planning systems and normal procedure. And it isn’t helped by the project’s status as the brainchild of Prime Minister Nikola Gruevski, whose resignation the protesters had been calling for. Gruevski in fact appears to have orchestrated the work himself. Speaking to a member of his party VMRO DPMNE, and someone who knew the Prime Minister personally, I asked why they had chosen the baroque style. He shrugged and replied “I don’t know, it is the Prime Minister’s taste”. 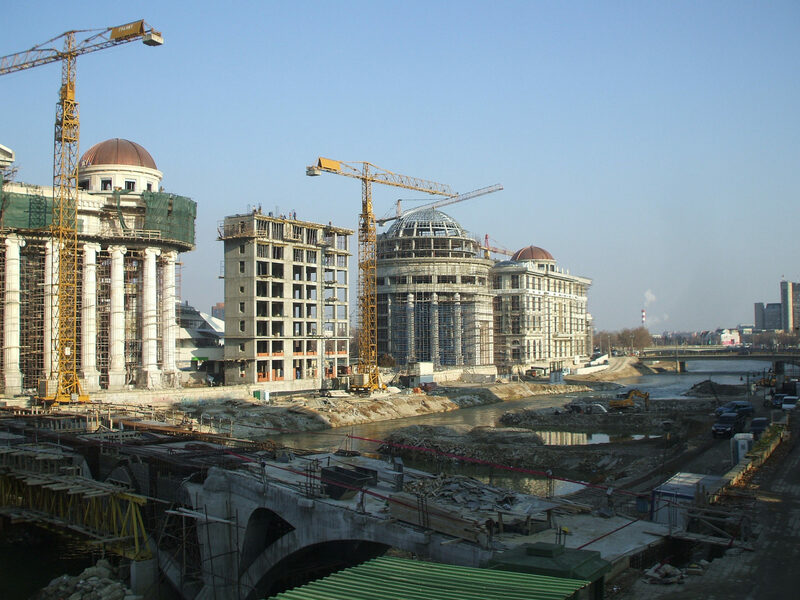 But while Gruevski held on to power the construction work at least seemed set to continue, even as the cloud of controversy and tales of money laundering continue apace. Many people’s biggest fear about the unfinished project, however, is what will happen if Gruevski is not re-elected. As the political crisis continues, the project’s fate hangs in the balance. In Skopje I found that among my friends and acquaintances there is a pervading sense of alienation. When a video was first released in 2010 showing the plans for the project, few Macedonians believed it could come to fruition – more likely an unachievable dream or a sadistic joke. Most have been continually surprised to watch as the structures have risen. The project has progressed and locals have been left baffled and increasingly angry. As construction work took over the city centre, it has become more and more disconnected from the reality of everyday life in Skopje. 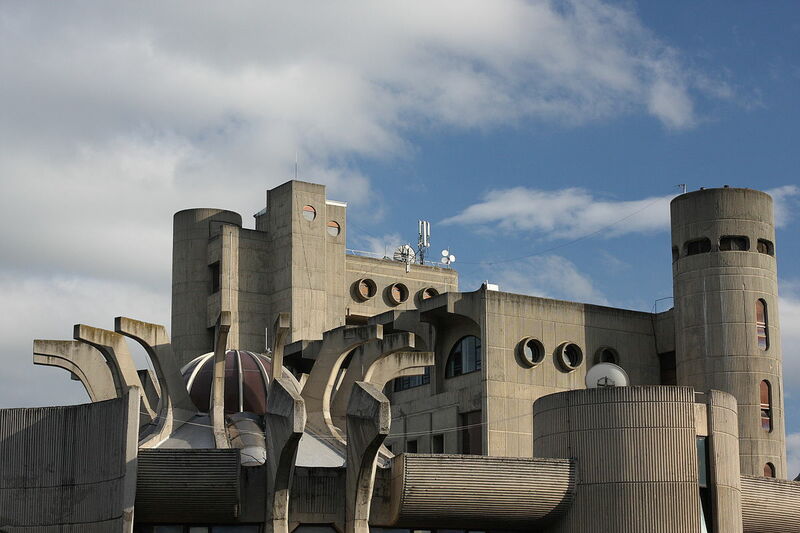 On the subject of alienation, it is clear that Skopje 2014 has primarily had this effect through its physical form – the architecture and sculpture is quite foreign to the style and standards in Skopje. For instance, the Architects Association of Macedonia have been particularly outspoken in their opposition to the project. And it’s easy to see why. Like the planning system, the AAM was completely ignored. It was involved in neither commissioning nor implementation. As a likely consequence, the architecture varies greatly in the quality of design and execution, but is on the whole insensitive to its context and unsympathetic to Skopje’s architectural heritage. Skopje’s ‘other’ architectural history: Janko Konstantinov’s Central Skopje Post Office. In the rest of the city I have seen signs of many architects’ respect and admiration of the work of Kenzo Tange and Janko Konstantinov, and the younger generation of architects emerging from AAM is clearly taking inspiration from the brutalist and modernist legacy of the Yugoslav period. Not so the architects of Skopje 2014. 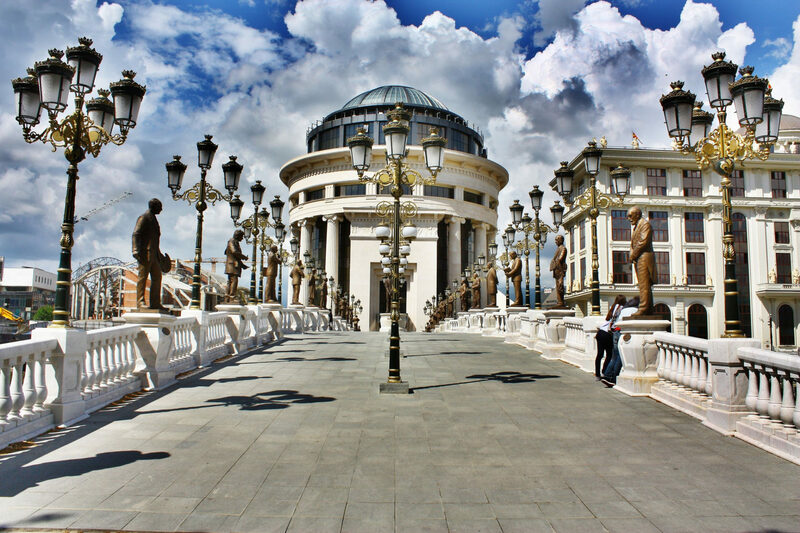 The neoclassical and baroque architecture of Skopje 2014 are foreign objects in a city more accustomed to Corbusian pillars than doric columns. A second source of alienation comes from the mounting costs of Skopje 2014 to a population struggling with unemployment and low wages. While the initial budget set out in 2010 estimated the total costs to be 80 million euros, the 2015 report by BIRN calculated the current total to be a whopping 560 million euros. In addition, many people feel that this figure is not reflected in the construction quality or standard of design and execution. All those involved, including architects, sculptors and construction firms have been dogged by questions of accountability. The expressed rationale of the project is to attract tourists and foreign investment. This acts as a third source of alienation for local people, as they were never a primary concern of a massive redevelopment that is totally divorced from the daily lives of its inhabitants. Where my friends once fished in the river has now become selfie central and where they once sat in the shade of the trees, a monument to a distant forefather stands in the midday sun. Young people dressed in ‘traditional’ costumes pose for photos for tourists. The main functions of the new developments are administrative, including, ironically, the constitutional court (which actually deemed the development illegal). There are also two museums, which can only be entered as part of a group guided by ‘experts’ who recite the ‘official’ history of Macedonia. What I have been told was once an inclusive and well used city centre (although underdeveloped) has become the playground of tourists and a few government employees and political elites. Many local people I spoke to not only had no reason to go, but also actively avoided venturing into the city centre. As locals have become increasingly detached from their city, they themselves have also taken on the role of tourist. One evening I forced a friend, a member of the city’s Roma population, to explore the area with me – we ate ice cream and walked across one of the new, entirely superfluous bridges – for me it was a regular route in my explorations, for him it was the first time he’d been there. A lifelong Skopjan stepping onto that bridge crossed into a world that was not his own – a world that seems closer to my own history and culture than his, that has no relation to his sense of identity, community or socio-economic status. Unfinished and unused spaces seem to be a legacy of Skopje 2014. As tourists themselves, what then do Skopjans have to say about Skopje 2014? In my experience locals speak about Skopje 2014 with as much bemusement and perplexity as any tourist, and probably more, having witnessed the twists and turns in this wild plot. They cannot make sense of any grand vision, they say that even the planners and architects themselves don’t have a plan, that they just make it up as they go along. In fact locals have no greater insight than the international media and their clichéd stories of a distant city making a mockery of itself. One conversation in particular sticks in my mind, and one which neatly encapsulates the whole situation. One day during my visit I was drinking coffee in the city centre overlooking the main square with a friend and his three colleagues (a convenient meeting spot rather than a regular haunt). As we sat discussing Skopje 2014, these three wise men took it in turns to explain to me their interpretations. The first explained how and why the government chose sculpture and architecture for what he saw as solely a money laundering scheme. The second, a graduate in History and History of Art, explained how the account of history told by our surroundings in no way represented the truth of Macedonian history and expressed disbelief in the story sold by Skopje 2014. The third, whose English was limited, uttered a single word: Disneyland. Rachel has a BA in Architectural Studies from the University of Nottingham and a MSc in Urban Studies from UCL. She wrote her master's dissertation about post-socialist architecture in Skopje, and having previously lived in Macedonia, is interested in the all things Macedonian. Rachel is also interested in housing, participatory processes, and architectural and urban theory. She is part of Failed Architecture's editorial team. I grew up in pre-Gruevski Skopje. Like most people at the time I had an ambivalent love-hate relationship to the urban environment of the central area. I both marvelled at its mixture of brutalist modernity, greenery and openness, and decried the lack of investment in maintaining the area. I hated the crumbled pavements, weeds and tall grass, and especially the ever present litter decorating all public surfaces. Even at the time I felt that Skopje was in dire need of refurbishment and a new wave of modernization that would bring back the sparkle it briefly attained after being rebuilt in the decade following 1963. I was even bothered by the conspicuous absence of at least some kind of monument in the central square. But I never dreamed that it could turn into the vulgar monstrosity it is today, nor that, on the whole, the country´s citizens would watch on approvingly as it was being erected. I guess I underestimated the sheer power of nationalist vanity. Perhaps, some people don´t necessarily mind living precarious lives of abject poverty, if they can project images of national wealth and glory to outsiders. I´m often told in Skopje by proud right-wing nationalists that: "Visitors can actually see something today in the centre". They sure can. I´m just not sure they see what they are expected to see. @Dario still you do not point what are you nostalgic for? All those structures you mentioned exist today. The sentence "it seems that you are not from Skopje" just shows your arrogance toward your fellow citizens, like you are so unique I suppose? Typical. If you look at the promo video for Skopje made a few years ago you will notice there are no people, only buildings. That encapsulates why Skopje 2014 is a failure - all about the grandeur, the monument, the building, but forgetting about liveability. At the end of the day, it's people that make a city, not buildings. @ Ivo Skopje was a nice City, well planned (Gradski Zid, Kej, Zeleznicka, Trgovski Centar, MNT, Karpos III / IV etc. ), with lots of open spaces and communal areas, boulevards, green spaces and parks ... There is plenty of evidence to support the above. The modern architecture is part of and focuses on liveability of the place, taking in account not only the visual aspect (design form) and the function but also more importantly the human interaction with the built environment. Today, in the developed world, local and city authorities are very careful to consider not only the design form but also the community wishes/aspirations and sustainability including any negative social and environmental impacts. BTW the earthquake was in '63 It seems that you are not from Skopje Best wishes D.
I loved the idea of bringing some buildings of the old Skopje back like the theater, the bank etc. and I totally LOVE how they turned. I did entered most of the new buildings and I was surprised and amazed how good everything was looking. But you say it's kitch, right? See now, is that really important? Is that what everybody can see? I like it… you can give me bunch of academy studies and try to prove it's kitch... okay... but I will still like it. Believe me, 99% of the people you talked to took a selfie with the new Skopje at least once. People who usually hate on Skopje 2014 hate just and JUST because of political reasons, they all secretly like it because you basically have nothing to compare it to. There was absolutely nothing before this happened. And it might be just me but while I was reading this post I felt like it's all against the nation. I really hate when some random stranger(s) just talk about our Alexander-thing. I found that part insulting to be honest. Also, the moment when you mentioned our prime minister was the moment I stopped to believe that this is objective post. Ummm, do you have pictures to post how was from before? Believe me, it was the worst post communist city ever, not fully recovered from the 1964 earthquake, not sure why some people are so nostalgic for? I wish someone can explain and tell me "oh I am nostalgic because of this, this and this (name some things please)". *slow clap* Amazing! Thanks for saying every thing out loud that is wrong with what was formerly my home town. I'm only 24 and have lived a great deal of my life abroad, as I am now. Still i witnessed the changes of my city as I was home for the past seven years, and only moved away five months ago. The Skopje the world sees today is not what used to be the city I was born in and loved so much. Sculptures grow out of the earth over night, when trees are being cut down. There is a ginormous monument planned, dedicated to Mother Theresa - one of the most modest people in history. The river banks seem to subside beneath the weight of too many buildings and there's ships in a river that is to shallow to swim in. Imagine how older generations of Skopje's people feel, when even I am just a foreigner in my home town. Thank you for perfectly portraying the city that is not it's own anymore!